We here at Miracle Car Wash strive to give you the ultimate car wash experience possible. Our number one priority is your satisfaction. Contact Us for a free wash card to come try us out. Miracle Car Wash is a seven-bay self-serve car wash open 24 hours a day seven days a week and 365 days a year. Prepay and Save! 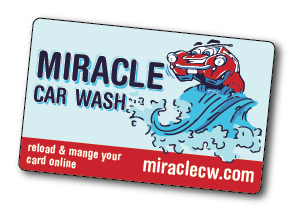 Use our WashCards or our Mobile option to pay for your services at miracle Car Wash! We accept all major credit cards at all of our bays.